When you request a quote, we ask for the basic information necessary to contact you and to provide that quote. Our quotes are always in writing first via e-mail, with a follow up call to make certain that you have received the quote and to answer any follow up questions you may have. Our only reason to request any information from you is to provide you with an accurate quote and to give you the quality service that you have come to expect from Dr. DecknFence . This is the sole purpose of this information. Dr. DecknFence does not share your personal information with any outside party for any reason. Dr. DecknFence stores the information gathered on its private server, protected against unauthorized access and disclosure of the material. The information is shared only with your local dealer in order to give you the best possible quote for the service being requested. All Dr. DecknFence dealers, employees and staff are bound by confidentiality agreements, and would be subject to serious penalties for failing to honor our obligations. 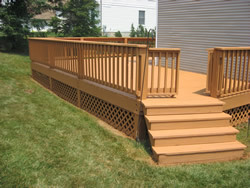 After receiving contact from your local Dr. DecknFence dealer, you may at any time request no further contact. Via e-mail, simply respond to the quote received with the word "Remove" in the title or text. By phone, simply tell the caller that you would like to be removed from the caller list.